Cornerstone Foundation Golf Challenge Registration is open! 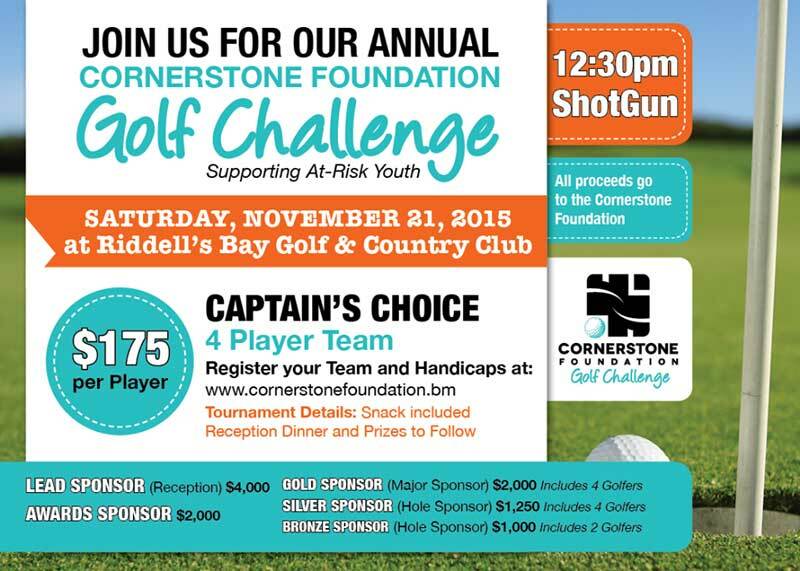 The Cornerstone Foundation Golf Challenge 2015 is happening on November 21st, 2015 at Riddell’s Bay Golf and Country Club. Register as an individual golfer for $175 or as a group of four golfers for $700. Corporate sponsorship packages start at just $650. Cornerstone Foundation’s goal is to provide support and help for at-risk youth and families in need across the island. All proceeds from the Golf Challenge will go to fund the Cornerstone Foundation Christmas Store, Youth Impact Mentoring Program, Entering the World of Work Program and The Berkeley Partnership. For more information on the work Cornerstone Foundation is doing or to register for the Golf Challenge please visit www.cornerstonefoundation.bm or call 296-2598. Spots are limited so register yourself and your golfing buddies today! Ahh, what is an “at-risk youth and families and why are they at-risk? Ill hold on to my race card just in case. Was supposed to be “Risk Card” my bad. My comment is addressed to the label “at risk”, don’t take it out of context.